We had a busy weekend planned. We’d heard from friends who’d done their other events that the Rock ‘n’ Roll running series were excellent to enter, so I was the lucky one who’s name came out of the 2-person hat and I was the one who got to run it. Kas had to make do with a weekend away. The race we planned was the Liverpool Rock ‘n’ Roll Half (there was a “full monty” as well, but only nutters run those) and we booked up nice and early to avoid disappointment. We booked early enough that it wasn’t officially a Redway Runners club trip when we booked up, and as a result we were in a different hotel to most of the other club members who went. A couple were in the same place as us, but not many. The hotel in question was the excellent little Hotel Indigo on Chapel Street. They didn’t have any family rooms so we booked two standard double rooms and hoped for the best. Anyway, before all of that we had to actually get there. As it was a Saturday we had the obligatory trip down to parkrun first thing and then dashed home to finish packing our bags before setting off up the motorways. The drive was fairly uneventful until after we stopped at Norton Canes for some lunch. As we were heading up the M6 around Stoke it started to rain, and it kept raining pretty heavily for the rest of the way. Heavy rain on the M6 always makes it slow, difficult to see, and quite dangerous. 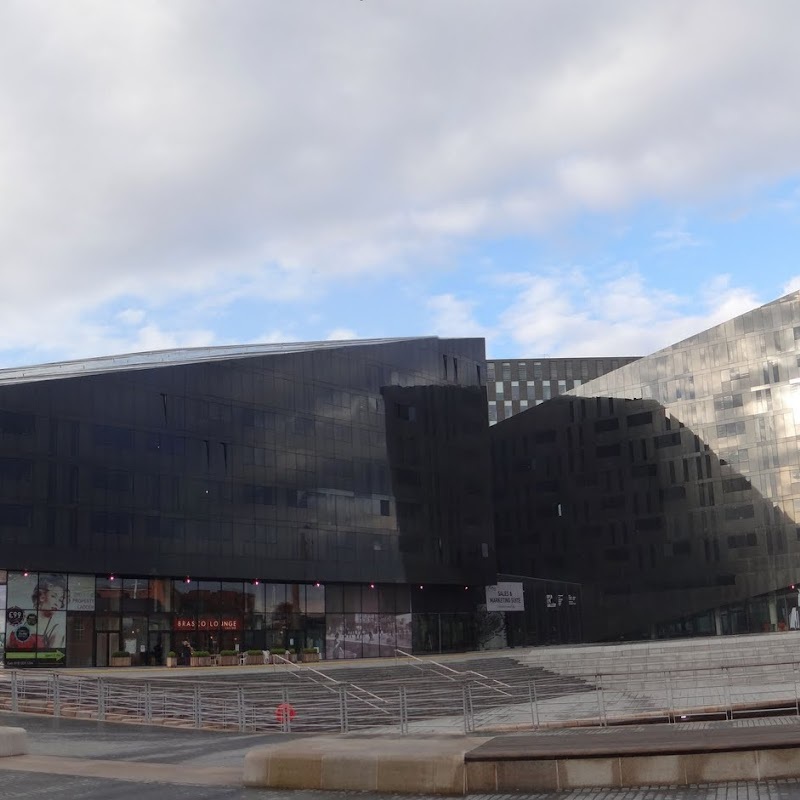 And when we arrived in central Liverpool to park up we hit the next problem – the hotel didn’t have its own car park. We had to park in a public multi-storey a couple of hundred yards away. Fine if the weather’s nice, not so fine when it’s chucking it down. We walked from the car quickly. After checking in and finding our rooms we chilled for a while before deciding it was time for some dinner – after all I needed a fairly early night and we were all hungry. Having failed to find a branch of our favourite Italian style chain nearby we resorted to asking the hotel for a recommendation, and they suggested we walk around the corner to Trattoria 51 – a local chain of two Italian restaurants. Meh ! How bad can it possibly be ? Well, it wasn’t bad at all. Aside from the fact that we were early so there was virtually no-one else in the place, it was really excellent. The food was very good, the staff were friendly (always an advantage when the kids are around) and the service was really good. If you’re in the area, it’s worth a visit. When we finished it was still fairly early, and there was still quite a lot of daylight left. 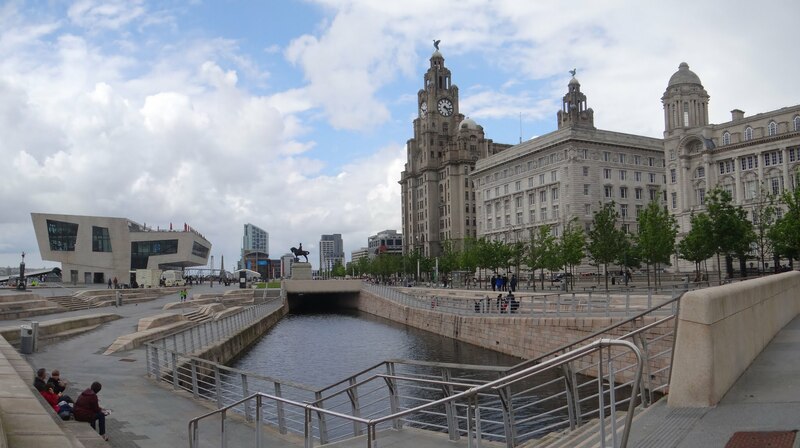 It had also stopped raining at last and there was more than a hint of blue sky around, so I suggested to Kas it might be nice to take a walk down to the Pier Head to look at the big buildings and get a breath of fresh air. It was a really lovely evening by this time, to be honest. So we made a quick dash back up to the hotel rooms to grab our cameras and then off we went. 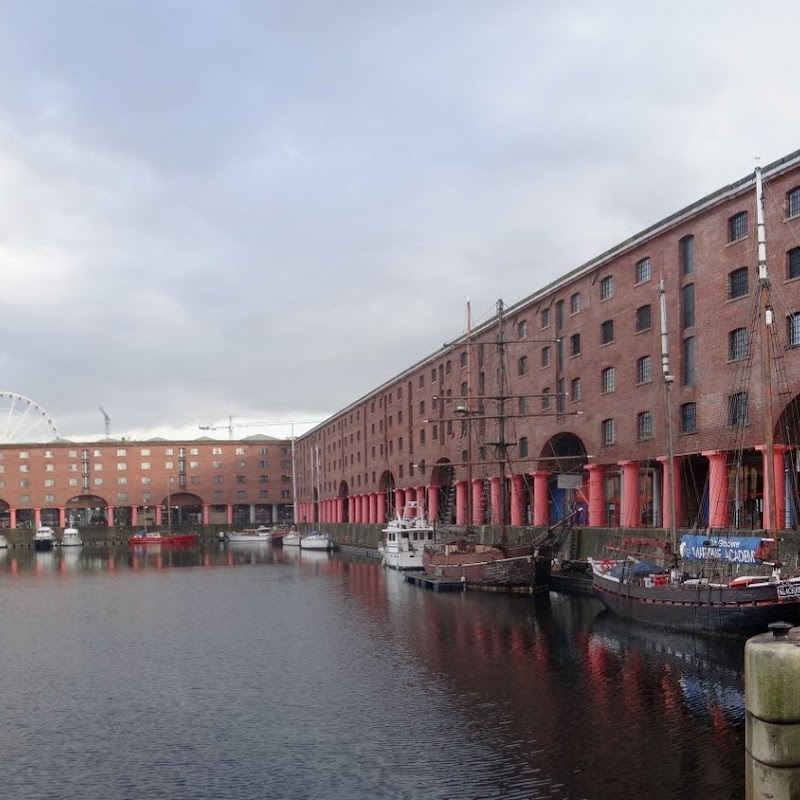 We ended up walking all the way along to Albert Dock and managed to get far enough to find where I was supposed to be in the morning, and more to the point, it meant I could measure (roughly) how long it would take me to walk here again the following morning. On the way back there were some signs that there was going to be a race in the morning, including some interesting road markings indicating who needed to run where. Straight on into that bollard for me then ! We awoke in the morning after a decent night’s sleep (for me and Izzy) and a painful, fitful night for Kas, who drew the short straw and had to share a bed with Ami the wriggle monster. Breakfast was open early enough for us to go grab something but not early enough for any lingering, so I got fully prepared for my race before going downstairs and left Kas and the girls in the breakfast room while I walked straight out and off down the road to find the rest of the Redway Runners Posse. As ever there were quite a few of us. We met up outside the Echo Arena, which was the designated Race HQ. They had a baggage drop and some frighteningly long queues for the toilets. I was going to have to time this one well. The race started at a very early 8am, which meant I was down at the start just after 7. It was quite cold at that time of the morning, but I had been bright enough to bring my sunglasses out of the car and pack them in my race bag. It looked like they’d be needed. At about 7:45 we started to mosey over to the start line, and I was greeted there by Kas and the girls, who’d finished up breakfast not long after me, and had then bumped into a couple of other Redway Runners who were staying at the same hotel (but not running). They’d walked down together and arrived just as I was starting to get lined up for the off, and so just in time for a quick hug while I was relatively un-sweaty. I can’t remember whether I’d set a target time for this but it was my fourth half of the year and I’d been getting progressively faster – well over 2 hours at the MK Festival of Running Half in March, 1:54 something at the now infamous Sheffield Half, and about 1:52 at the inaugural MKM Half Marathon on the first May Bank Holiday. The MKM Half wasn’t a PB but it felt like it should have been and I was feeling nicely refreshed and ready to try another one. When I got back I felt surprisingly good. There were a few other Redway Runners around so we did a quick photo and then made our way in through the Echo Arena to get out bags and goodies. I like the way they did it here – instead of getting a pre-packed bag stuffed with useless flyers they provided a bag and a series of help-yourself stands, so I was able to pick up a cereal bar, some crisps, a drink, a banana and another drink but no bits of paper. Over at another desk they had all the t-shirts – I went for the largest, as ever. And then they saved the best bit until last. They were handing out beer tokens. Marvellous. One for each finisher, entitling the bearer to one of Mr Cobra’s finest, to be served outdoors in the sunshine. What could be better ? Well, two of them could be better, and somehow Kas had managed to acquire one of said beer tokens from someone else. Remember the race started at 8am and it took me less than two hours. I can’t remember the last time I was sitting outside at 10:30am with a beer in my hand. Not only did they have beer, they also had music. Well, it’s a Rock ‘n’ Roll event, I suppose, so just after the half there was a half-hour set from The Christians, which was spot on for me. After all this beer the assembled company decided it was time to retire to a nearby Weatherspoons for some breakfast. Blimey was it busy ? We went upstairs – no seats. So we went downstairs and spotted some likely punters who were leaving and nabbed their seats before they changed their minds. A suitably heavy carb and lard-laden repast was had by all (especially by me) and Ami did a fine job of making the world’s longest drinking straw. Well done that girl ! By the time we’d finished breakfast I was beginning to feel the weight of the morning’s activity (and I was beginning to smell the aroma of it too) so we left the assembled company and plodged back to our hotel for a bit of a rest and a clean up. To be honest, I could have slept for the rest of the afternoon, but it seemed to waste a beautiful afternoon when there was a) a few Redway Runners finishing the marathon at some point and b) a few geocaches available to be done. So I had a quick shower and got changed then we headed back out for a bit more. Anyway, the pros say it’s a good idea to keep moving for a few hours after a long run to stop yourself from seizing up. So we legged it back down past the Albert Dock, this time walking along the river side, grabbing a couple of caches on the way. By far the best was Albert Lock – a sneaky little Herbert that involves identifying which one of the very many padlocks attached the the chain contains a little bit of paper instead of a locking mechanism. It’s surprisingly hard. Once back at the Echo Arena we were obviously duty bound to have a go on the big wheel. It’s becoming a bit of a habit (or another one of the “holiday rules”) after the trip to Brighton earlier in the year. This one sails nicely above the arena and gives an impressive view of the city centre in one direction and the river in the other. The glass was a bit mucky and scratched, which affected photo-taking opportunities a little bit, but the kids loved it (all 3 of us) and I think Kas did too. And we got to spin round a whole four circles before having to get off again. We also went to greet a few more of the Redway Runners after their marathon exploits, and this time we got to listen to The Farm for a little while. 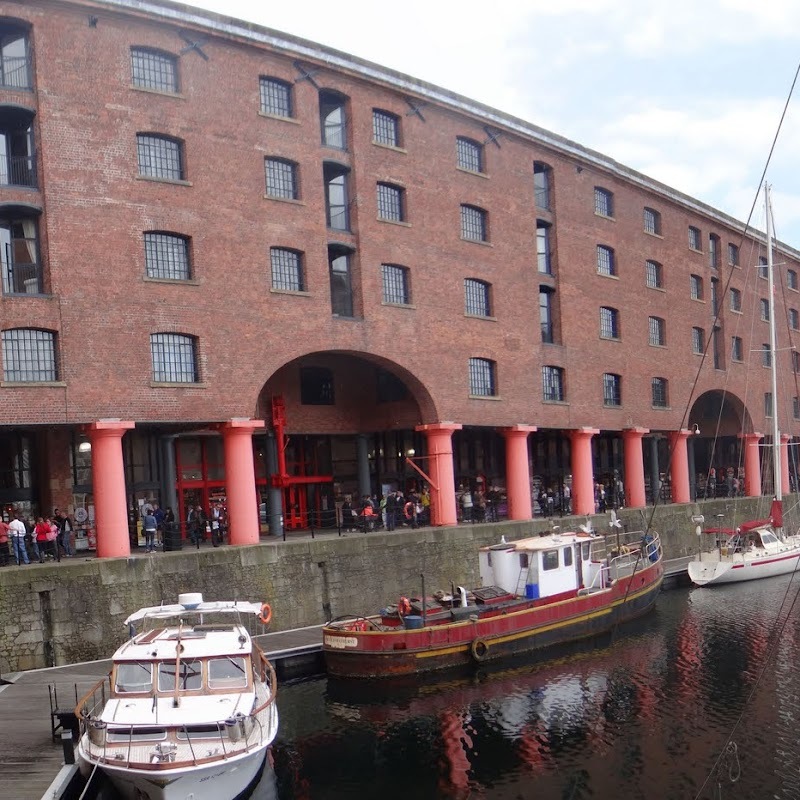 Eventually we decided to wander back to the hotel, this time walking through Albert Dock and stopping in the museum place for some souvenirs for the kids, before retiring to the hotel for a brief respite and planning an evening. There wasn’t much to plan really. We needed a restaurant. The hotel came up trumps again by recommending Olive on Castle Street. OK, it’s another Italian one, but it was good. It was extremely busy so we were glad we went quite early, but even so we still had to sit at the bar for a while until they could clear us a table. After we’d finished we went back to the hotel and had a coffee and a digestif while the kids ran merry riot in their own special, quite restrained, way. A new PB. I’ve gotta be happy with that ! And so to Monday morning, the morning after the day before. And guess what ! Nothing was hurting me. I must try running really early, drinking a lot and standing out in the sunshine all afternoon again. It seems to prevent running aches and pains. 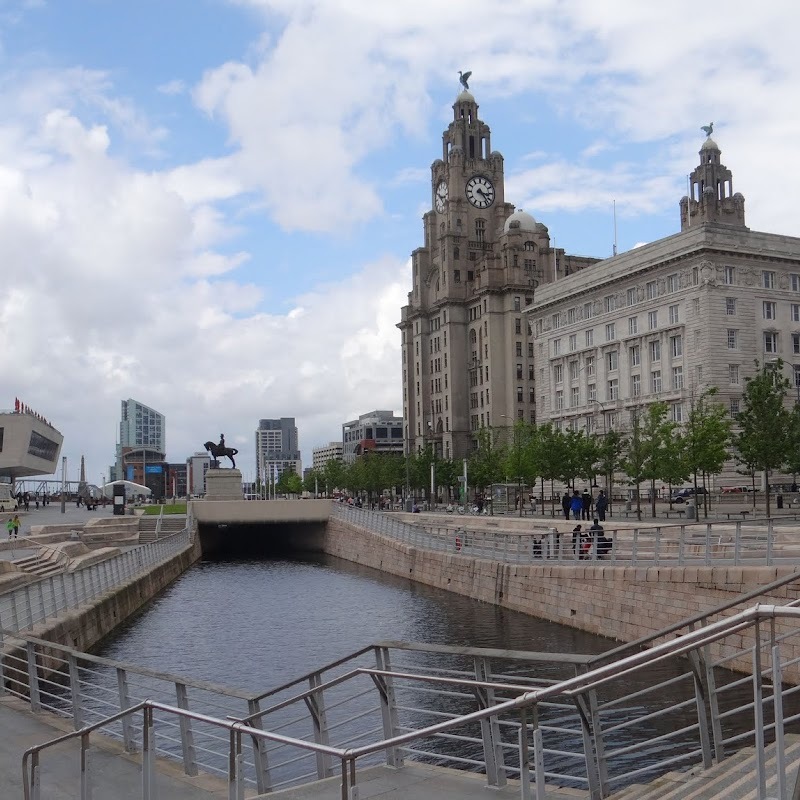 We legged out way back down towards Albert Dock again again, and this time we grabbed a cake and a coffee at a cafe there and went into one of the many tourist-tat boutiques to buy some sweeties and other gubbins before deciding to head off. The car was exactly where we’d left it, which was good, and as it was the first ever time I’d been to Liverpool I asked Kas if she was OK to take a trip up to Anfield, not particularly to look at the football ground, but to pay my respects at the Hillsborough Memorial. I was working away in Holland when it happened but still remember watching the news broadcasts with horror, and it was, of course, my team at the other end. You don’t forget things like that in a hurry. Not being familiar with the layout of the stadium, though, the memorial proved to be quite awkward to find. We parked in the massive Stanley Park Car Park and somehow I had it in my mind (without knowing) that the memorial would be at the Kop End, but down there it’s all gates and club shops and the like. The memorial is at the other end, which meant we basically walked all the way round and ended up only a few yards from where we’d started. Never mind. Football grounds aren’t that big, really. We spent a few minutes at the memorial, quietly reflecting and trying to explain to the kids what it was all about., and then it was time to jump into the car and drive home. It was early afternoon and we had to get back, albeit that the kids were on holiday for the following week. What an excellent weekend. My stereotypical preconceptions about Liverpool were as just well and truly smashed as my half marathon PB was, and we’d had an excellent couple of days. Kas is going to run it next year.